It’s been a little while since I posted a pregnancy update, so I thought I would write a little about what has been going on. 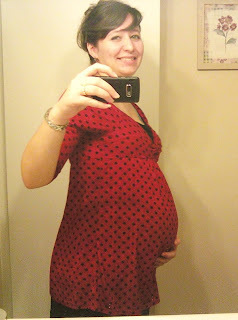 I still plan on writing more about my pregnancy and symptoms, but I am waiting until I get farther along! As of today I am 27 weeks and 2 days. I usually take a picture every two weeks so I have two I have not posted here yet. Me at about 26 wks! It’s hard to believe that in only a little while I will be holding Adam in my arms. It makes me very happy, excited, and nervous! I have been doing good, just really tired a lot, and going through a lot of back pain. I already had scoliosis, so this baby is doing a number on my back! I have been taking some warm baths and showers before bed and that has helped a lot! Coming up, I have my diabetes test, and another ultrasound to check Adam’s heart on the 25th. I am so excited to seem on ultrasound again only one more week! A little nervous about drinking this thing for the diabetes test, but I am sure I can keep it down. Hopefully it doesn’t taste too bad! We are also planning on having maternity shots done, and I am really excited about that. I think we will be doing them next month some time, and I can’t wait! My baby shower is also next month, and I am excited to see how that will go. Lots of pictures to follow I am sure! You have that "adorable" pregnant look. 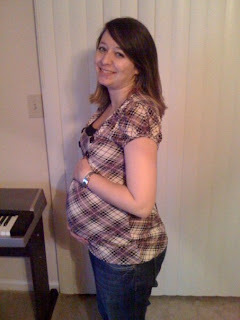 I looked like a water buffalo when I was pregnant (many years ago). Praying GOD will bless you and baby Adam. You look adorable and so happy, Kathryn. It's great to hear you are doing well. Wishing you many blessings. Can't wait till you post pictures of Baby Adam. God bless. Cuuuute! I think I'll change your pic on my blog if it's okay with you. I like the Tummy pic better (smile). The book wouldn't fit in Jaylan's small cookie box, so I'll have to send it separately. Don't hold your breath…I'm terrible about going to the post office! Aww,, you are so cute pregnant! Good luck on all the tests coming up! Hes getting bigger 🙂 Dont worry about the drnik it dosent tast like medicine, it just tast like really sugary and its carbonated. First, you have– without a doubt– the cutest maternity clothes I've ever seen. I want to be PG again just to wear that red and black polka dot number! Second, don't stress out too much about the diabetes drink. It just tastes like an extra-sugary, extra-tangy Gatorade. You look amazing! Continued prayers for you and little Adam. The drink isn't that bad, trust me the old lemon was revolting and you can call and make sure they keep it cold (this helps a lot). It's similar (but not just like) a flat orange drink. Remember if you get sick, they make you drink it again, so just down it as fast as you can. You look beautiful in your picture!! I had maternity photographs done with Emma and ended up loving them! Very precious to me! The drink really doesn't taste that bad. I just remember it being really sweet. Can't wait to hear how your maternity shots go. I definitely wish I had them done when I was pregnant!